The Swift 4 is a lightweight development of the Rush 4, weighing in at an incredible 1300g less than the Rush 4 (in the MS size). Constructed with a hybrid mix of light and ultra-light materials, the Swift 4 offers Shark Nose solidity and high levels of performance in a lightweight, compact package. 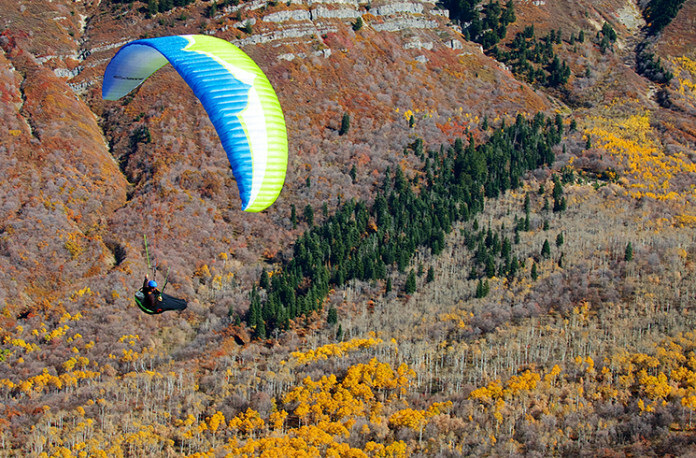 The original Swift not only set a new standard for a class of wings, it also created a new class of paraglider. Lightweight, agile, with top of class performance and a lively but balanced feel in the air, the latest edition of the Swift series has benefitted from the performance breakthroughs that have made our sport-performance class wings, such as the Delta series, so popular. With a Delta 2 type arc, mini ribs and plastic nose reinforcements, 57 cells for a super clean leading edge, and a 25% reduction in total line drag compared to its predecessor, the Swift 4 is the most efficient wing we have ever produced in the category. The Swift 4’s complex hybrid lightweight construction blends design techniques from the Geo series with features from the LM5, which dominated the 2013 RedBull X-Alps, and the Alpina 2, which has broken several vol-biv performance records during its tenure. The result is an impressive level of durability and lightness, in a glider that fits comfortably in the top of the Sport-Intermediate class. The Swift 4’s weight has been reduced and optimized not only by changing the main surface cloths of the Rush 4, but by carefully tuning hundreds of design features throughout the wing. Its leading edge is constructed from N20D, which has proven to have the best longevity to weight ratio available in this class of fabrics. The trailing edge section, making up the majority of the top surface, and the bottom surface, are both constructed from Porcher Skytex 27g cloth, used for many years in our Ultralite series of wings and also our highest performance gliders such as the LM5. Compared to the Rush 4, pilots will notice a crisper and more agile feel in the air. Thanks to the light construction, the Swift 4 has more agile handling, increased feedback and higher precision. The low weight gives it a sporty, dynamic character and is in general a more sensitive wing. Due to these characteristics, it could be said that the Swift 4 has slightly elevated performance compared to the Rush 4, globally speaking. The Swift 4 features all of the best performance enhancing features that have made the Delta 2 and the Rush 4 so popular including the new SharkNose, an advanced arc, and very low line drag. Our testing has shown that, like the Rush 4, the Swift 4 is a wing that will inspire confidence in active air. A moderate aspect ratio combined with the compact and predictable handling made possible by the Shark Nose, the Swift 4 offers an impressive blend of ease of use, lightness, and performance. Thanks in part to its light construction, Swift 4’s launch characteristics are even better than the Rush 4, with an easy-up inflation and a light and balanced feel when ground-handling. The Swift 4 sits between the Geo 4 and the Alpina 2 in our range, and is our top of the line Light-Sport- Intermediate class wing. Pilots who prioritize comfort over agility in the intermediate or sport-intermediate classes, should look to the Geo 4. Pilots who want the maximum amount of performance and agility possible in this class will find the Swift 4 to be an excellent option. It is suitable for a wide range of pilots, from recreation flyers to experienced XC hounds alike, however it is not suitable for training or low airtime pilots. We think the Swift 4 will satisfy even the most demanding pilots in the Sport-Intermediate class, and maybe even tempt some pilots from more advanced classes. It makes an ideal hike and fly / vol biv wing for demanding take off locations and long XC’s, and an excellent travel wing due to its low pack volume. When the original Swift was finished, we at Ozone were extremely proud of the result and felt that this new class of wing would become a favourite amongst the world’s pilots in the EN B and C categories. Now that the Swift 4 is released, we are even more excited to share our labours with you, and we hope that you enjoy this wing as much as we have. Please let us know what you think, we love to hear from you.